Experience a quintessentially English romantic countryside getaway at the 17th century Macdonald Compleat Angler, located in Buckinghamshire on the River Thames. Dine at the hotel's acclaimed restaurants: the three AA Rosette-awarded Riverside Restaurant and Sindhu, Michelin-starred chef Atul Kochhar's latest venture. 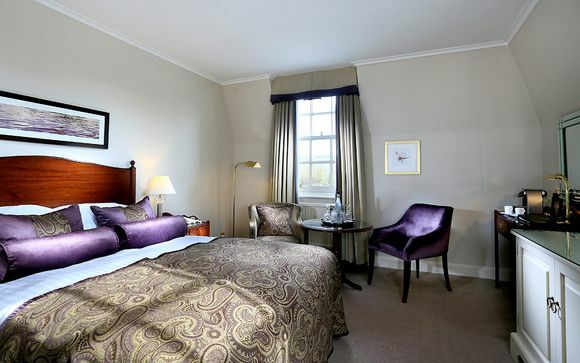 Members will stay in an elegant Classic Room and recieve a bottle of House Wine in their room upon arrival. Welcome to the Macdonald Compleat Angler – shrouded with romance on the edge of the River with its gliding swans. Just slightly outside the bustle of London, this four-star establishment faces the Thames in the town of Marlow in Buckinghamshire – an ideal spot for hand-holding strolls, fishing trips and jolly English afternoons in the neighbouring Windsor, Eton or Henley. Golf lovers will be glad of the nearby Bisham Abbey Golf Club, where they can practise their swing in a pleasingly tranquil environment. It’s a charming sight: foaming river spilling over shallow walls; church and elegant 1832 suspension bridge; enviable waterside houses with their boat houses; great weeping beech on the opposite bank, green lawns below. 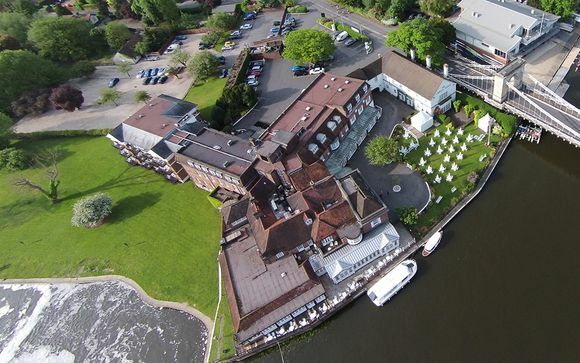 A well-established historic hotel dating back to the 17th century, the Macdonald Compleat Angler sits with pride on the riverside and houses an unsurpassable dining experience for its guests. Choose between the classic cuisine at the Riverside Restaurant, where you can dine by candlelight al-fresco in warmer months, the new Sindhu restaurant from Michelin-starred Atul Kochhar, or a classic Afternoon Tea in the charming Gardens. Drink champagne and martinis à la T.S. Eliot and F. Scott Fitzgerald in their hey day at The Walton Bar & Lounge – lovingly named after Issak Walton who wrote the famous book "The Compleat Angler"
Whatever your reason for choosing to stay at Macdonald Compleat Angler, you'll find the Classic bedrooms are plush, characterful and wonderfully stylish. An ode to the riverside location, after a busy day of adventure or business, your bedroom will be a welcome and comfortable sight to behold. The three AA-Rosette-awarded restaurant boasts gourmet British cuisine with sublime views of the River. Dine here for a truly romantic and authentic experience, devling right into British countryside lifestyle. This elegant restaurant, a venture from Michelin-starred chef Atul Kochhar, exhibits the very best of traditional Indian cuisine, presented and gifted with a contemporary twist. The oak-panelled Walton Bar & Lounge was once a favourite of T.S. Eliot and F. Scott Fitzgerald and offers a comprehensive drinks menu in an elegant setting. The exquisite afternoon tea is served traditionally on beautiful cake stands with home-made savoury finger sandwiches, fluffy scones with jam and clotted cream, a selection of cakes and more.